In 2018, Humanity First began taking its firsts steps in Paraguay, a country with a population of about 6.8 million, and known as “The Heart of South America”. Among other projects, Humanity First Paraguay has held food and clothes distributions, blanket donations in the winter months and blood drives. 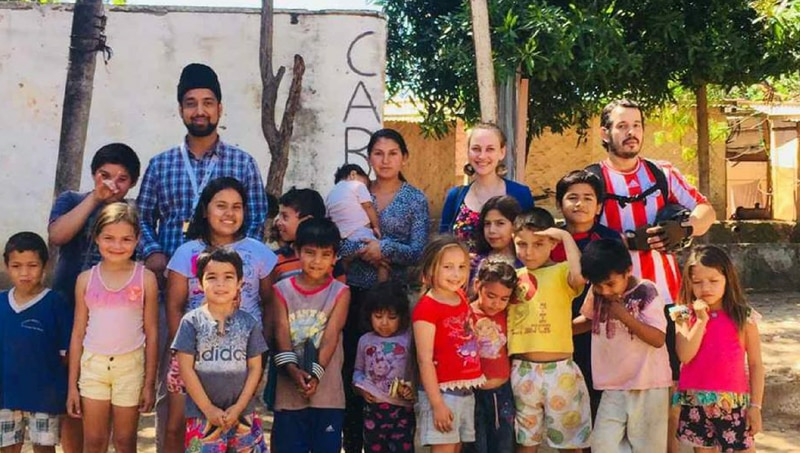 The Ahmadiyya Muslim Jamaat of Paraguay, along with Humanity First, worked to relieve suffering caused by floods in the city of Asuncion, the capital of Paraguay. Throughout the month of December, every weekend, we went to a neighbourhood by the river where Paraguayans had sought refuge from the flood and were living in a makeshift refugee camp. We took snacks for children, including bread, bananas and yogurt. We also did some activities with them, such as reading stories, playing soccer and having races. On 23 December, food baskets were donated to 65 families so that no family would spend the holiday season in hunger. Each basket contained rice, pasta, tomato sauce, lentils, canned peas and corn, salt, crackers and biscuits. It was a beautiful experience to be able to share a little bit of food, joy and hope with humble Paraguayan families.